Vegan cakes with no compromise on taste or quality! According to The Vegan Society, 1 in 3 Brits have stopped or reduced their meat consumption and during last year, 1 in 6 products launched claimed to be vegan. Our sales teams are overwhelmed by the demand for new vegan products from our customers and our sales team works hard to source tasty, innovative products to suit meat-free diets. This month sees the launch of delicious new cakes and slices from The Handmade Cake Company. 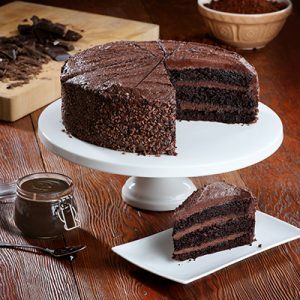 For many years they have supplied us with quality cakes and bakes, and now we are expanding our range to include vegan options, many of which are gluten free too. – serve hot with a delicious vegan ice cream! We also have two slices on offer during February. 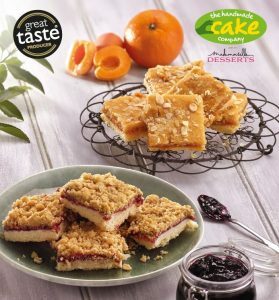 This Apricot, Orange & Almond Slice has a shortcake base, layered with apricot jam filling and topped with an orange and almond sponge with a crunchy topping of flaked apricots and oats. This Blackcurrant Crumble slice has sticky blackcurrant jam sandwiched between a shortcake base and a crunchy oaty crumble. There are many more new products this month, click here for more info. The Handmade Cake Company will be showcasing all of their new products at our forthcoming food show, so you’ll be able to try them for yourselves! 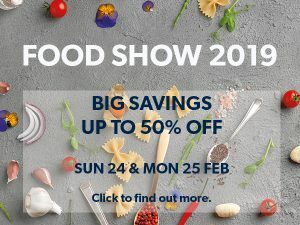 Find out more about our exciting food show and the savings you can make, by clicking on the image below.